I met Claire Parnet in May 1969, on the set of a TV show with Maria Callas. It was a pretty complicated show, so the set was off-limits ... Callas asked me who an old man was, taking pictures on the sly. I told her it was Cartier-Bresson, who represented for photography what she did for music ... And then I noticed a young woman, and asked around what she was doing there. She was a friend of Guy Seligmann, the director of the show. 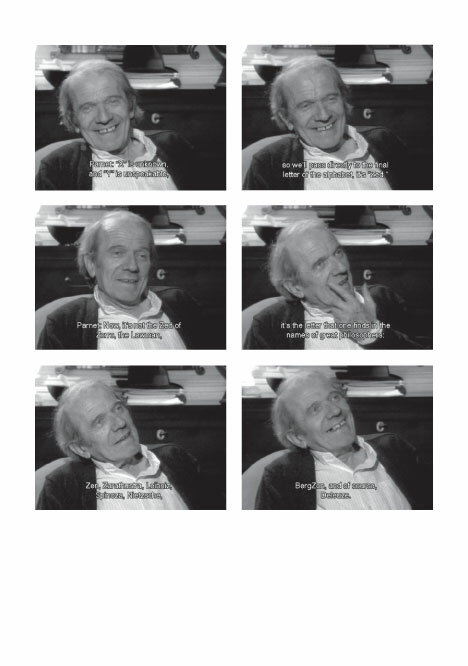 We spoke, saw each other again, started having dinner at Claire’s mother’s house ... And then I discovered she knew Deleuze. Not that I have many obsessions, but I figured it would be good to film some­thing with him. I didn’t quite know what. I told Claire, she spoke to Gilles about it, who must have said something like “yeah, yeah, yeah ... well, no ... we’ll see.” It lasted for 20 years. Whenever I’d see Claire, I’d tell her: “Don’t forget to tell Gilles that I’m still interested, and that we can do it whenever he wants.” And when I’d run into Gilles, I figured it was part of my role to remind him, even if he always said no. It became a kind of joke.